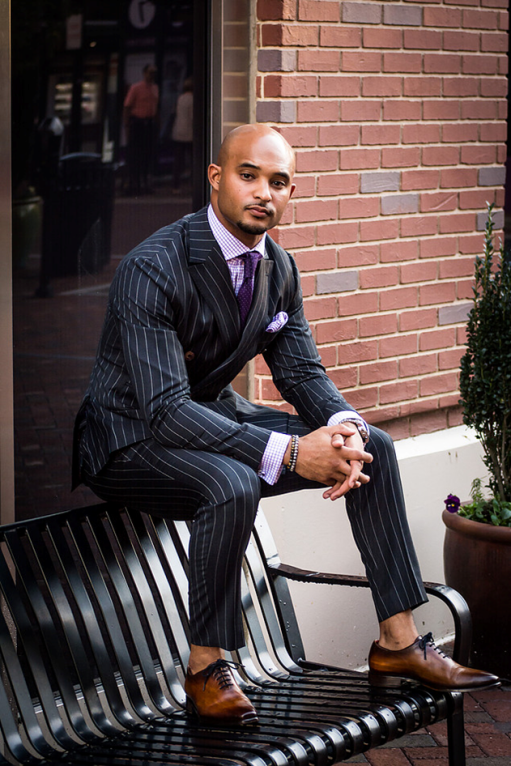 Omar Kinnebrew is a luxury clothier and style consultant in Atlanta, GA. His company provides high-end custom suits, shirts, coats, shoes, and casual wear for men and women across the globe. As a man of style and creativity, Omar began selling gentlemen accessories in 2014 but quickly turned his focus to creating custom-made pieces. Understanding the need for a well-priced, high-quality garment offering, he pulled together the best master tailors and cobblers and created his "Bespokuture" line in 2016. He now works passionately to deliver exquisite creations for those who seek a higher level of aesthetic prominence. Clothing, however, is not his only passion. Omar cherishes his time relaxing, traveling with his family and creating new memories with his phenomenal wife and one-year-old son. He also has a giving spirit and strong presence in the community. Whether it's time as a mentor with Big Brother, Big Sister, or serving on the board for the Auditory-Verbal Center. He also works closely with 40 Girls and Some Shoes to provide the homeless and working poor with gently used footwear; and builds houses as a Habitat for Humanity skilled supervisor. In addition, he blends his passion for refinement and helping kids by executing programs for middle and high school-aged students that provide them with the foundation and mindset to mature into stylish, intelligent and exceptional members of the society.